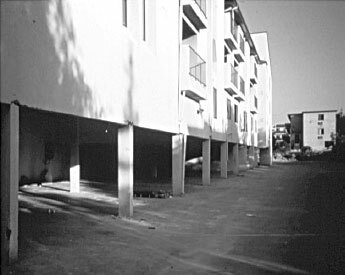 Apartments with “tuck-under” parking like this are a classic example of soft-story construction. Look for larger openings in the lower floor, such as a garage door or a hillside house built on stilts. Consult a professional to determine if your building is adequately braced. 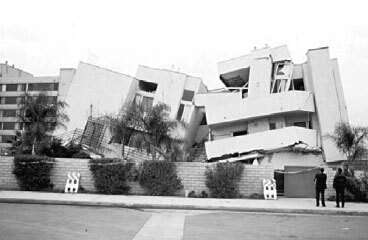 Apartments and condominiums with parking or commercial space on the first floor are prone to collapse if ground floor walls and columns are not strong enough to hold up the building during earthquakes. When the “soft” first story fails in a building with “tuck-under” parking, crushed cars often result. 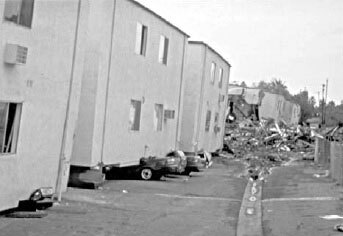 Buildings with parking at the ground floor, or large amounts of windows and few solid walls can have earthquake weaknesses. Consult with a qualified engineer or architect to help you evaluate your building’s condition. Structural collapse resulting from soft-story construction. Soft, weak, or open front stories can be strengthened to prevent collapse. You should rely on the advice of a qualified engineer or architect.